Taiping in Perak. Formerly it was called Maxwell Hill. 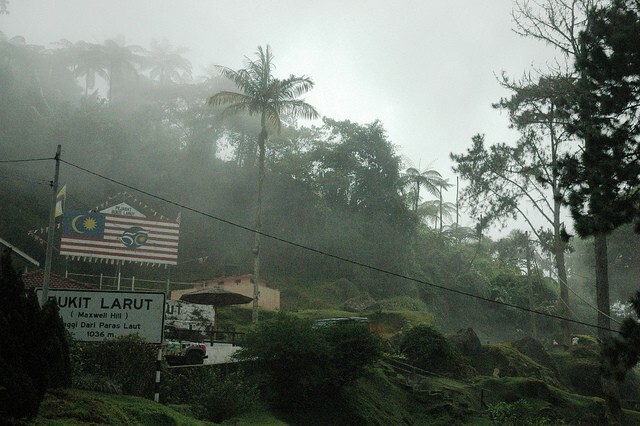 Bukit Larut is approximately 1250m above sea level. 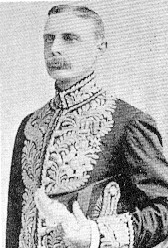 (1846 -1897), after whom Maxwell Hill is named. He was a British Assistant Resident in Perak. 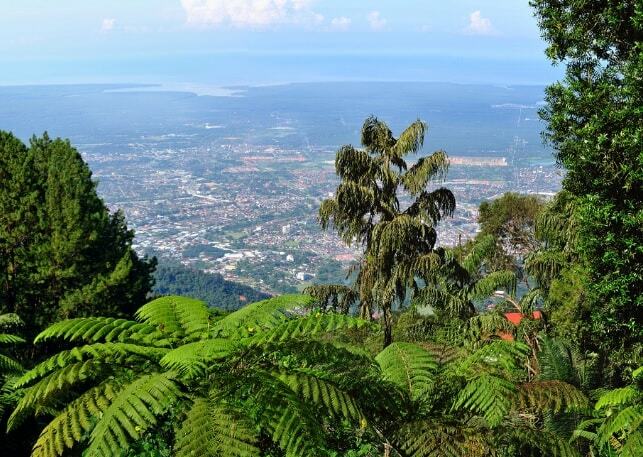 Bukit Larut is not nearly as developed as more celebrated hill resorts such as the Cameron or Genting Highlands. However, it preserves much more of the atmosphere of a colonial hill station, with modest, welcoming bungalows, carefully cultivated gardens, and a pervasive atmosphere of cool quietude. Reaching the top of the hill requires a four-wheel drive jeep. Since private vehicles are forbidden to drive up the hill, the authority caters to this service with 4-wheel drives. A land rover is available at the foot of the hill. It leaves every hour from 7am to 6pm. A 30 minute drive up the steep hairpin bends will bring you to the top of the hill. The narrow winding road was reportedly built shortly after World War II and was completed in 1948. The road up twist and turns through tropical virgin jungle, and fresh green fragrance and cool air greeting you as you ascend. In the past, coffee and tea were grown on an experimental basis but seized to continue due to transport and logistic complexities. Midway to the top is the Tea Garden House situated. That was once part of an tea-estate. The view at this point is magnificent and features the entire Taiping town as well as the Lake Gardens. Also visible are the suburbs of Aulong and Simpang and the 19km stretch of Taiping - Port Weld road. 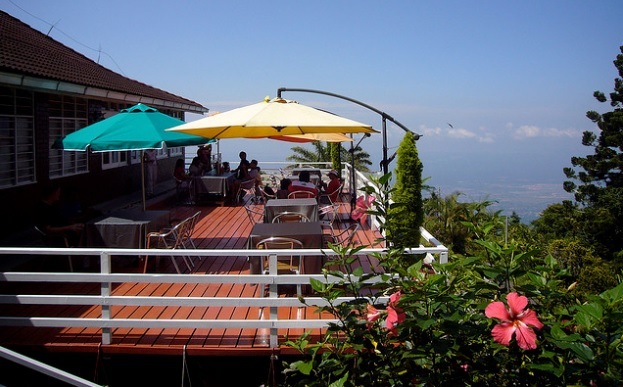 At the summit you are treated to a spectacular view of the West Coast of the peninsula. On a clear day, it is possible to view the sweeping coastline stretching from Pangkor Island to Penang. incidentally happens to be the only accessible summit. The hill is riddled with groves of evergreens and vibrantly colorful flora and fauna. Nowhere in Malaysia will you witness a wide canvass of roses, dahlias, daisies, pansies, petunias, lupines and marigold abound in profusion. The cool climate also favours golden sunflowers, reputedly the largest variety in the country. To top it all there is a waterfall for cool fun. Bird life here is plentiful. The best trail for bird watchers is the Gunung Hijau Trail, which spirals up towards the summit of Gunung Hijau, one of the peaks of the hills. The unspoilt mountain forest is also home to smaller fauna such as gibbons and squirrels, while its flora comprises species such as wild orchids, Mountain Giant Fishtail Palm and many species of bracken-like ferns. Besides leisurely strolls through verdant flower gardens or indulging on relaxation spots, visitors also have the option of playing tennis, 1115 meters above sea level, just below the clouds. Local rumour has it that there are several Sumatran tigers roaming around in the dense jungle. 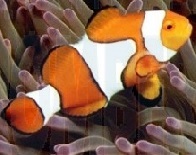 Occasionally, they loiter on the resort grounds but escape being sighted yet leaving only their footprints behind. There are a few bungalows and a rest house available up the hill for renting... it costs around RM 38 for a room to about RM 400 for a bungalow per night. The hill resort is a marvellous place for those who treasure silence and peace, and those that like to seek a sanctuary above the clouds.